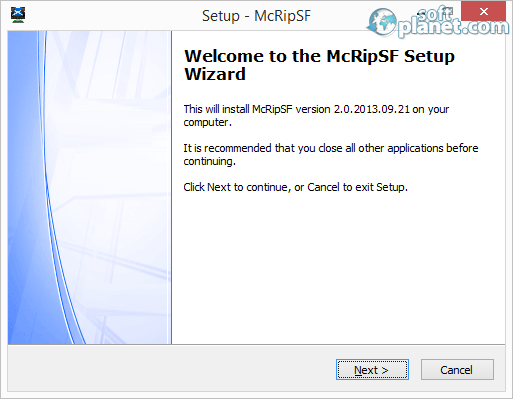 SoftPlanet makes it possible for everyone to get free McRip SystemFiles download directly from our servers. There is no registration needed for downloading. McRip SystemFiles installs a lot of components, so be ready for many installation processes that have to complete until you can use this free program. The download also takes some time, because the application is a big one. But it includes versions of apps that are important for different operations of your system and that's why it is good to have them as part of your file system. The list of apps that are installed is quite long. There you have DirectX from June 2011, Silverlight 5.1, Flash Player 11.8.8 for Internet Explorer, Shockwave player, Java Platform for x64 and x86 systems and Adobe Air Runtimes 3.8. All of these programs can be selected separately if you want to install them by themselves or you want to add all of them. 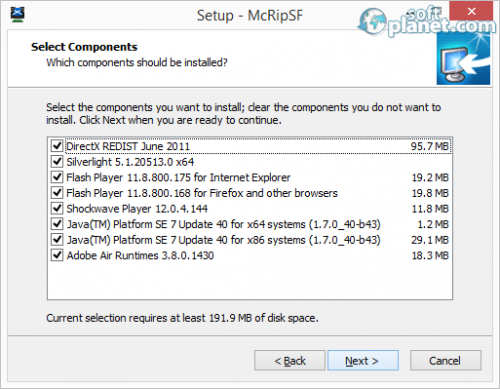 McRip SystemFiles helps you to fill the list of needed programs in your operating system. Thus you will have all that you need with a single installation, which takes some time. But it's much better to have them all in one install than to download them separately. Our security scan shows that McRip SystemFiles is clean from viruses. The current version of McRip SystemFiles has been scanned by our system, which contains 46 different anti-virus algorithms. That ensures that McRip SystemFiles 2.0.2013.09.21 is 100% safe for your computer.